Since we had five days at the park, we left few roads untraveled. The first day we did what I would consider the ultimate tourist trip— visiting all the geysers and hot springs, including Old Faithful and Grand Prismatic. We skipped the busy hotspots during the day and came back to them on our drive back to camp in the evening. Seeing the most popular sights at sunset, without the crowds was THE BEST way to see Yellowstone's highlights! The second day we drove a (slightly!) less traveled route going around the north loop. We saw the famous Mammoth Pools, Tower Falls and the Norris Geyser which was definitely a favorite of everyones. The Porcelain Pool at Norris Geyser was the most memorable spot from the second day. We watched the sun set over the boardwalk and learned that it’s the parks fastest changing pool. The Porcelain Pool is filled with small geysers that constantly blow steam. The pool's sediment plugs the geysers quickly, pushing the steam to vent elsewhere, changing the pool hourly. We had worn Zach’s parents out by our third day in Yellowstone so Zach, his sister and I went hiking. 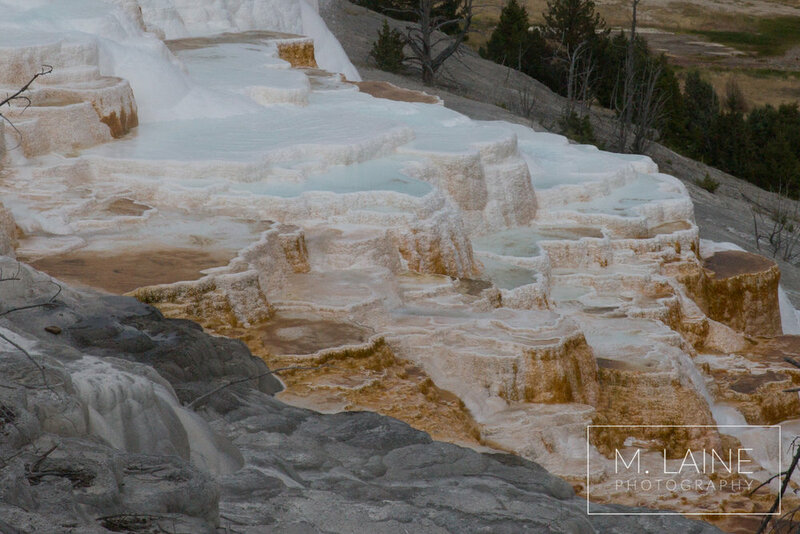 There were so many incredible hikes to choose from, but we decided on hiking to Mystic Falls via the Biscuit Basin Overlook, in addition to hiking to the Grand Prismatic Overlook. Of those two hikes, we enjoyed Mystic Falls and the Biscuit Basin Overlook the most. Not only did we get to see Old Faithful blow while we were on top of the overlook, it also rained, snowed and hailed! Thankfully us North Westerners always bring raincoats hiking, so we had a blast while it thundered and lightning nearby. The trail description said Mystic Falls is moderately trafficked, so we were happily surprised to see very little others on the trail and had both the overlook and the falls to ourselves. The hike Grand Prismatic Overlook was much more heavily trafficked. It was gorgeous to see Grand Prismatic from above, but we were hoping the earlier rain had scared off more people. I can't imagine what the crowds would look like on a sunny day. We made a spontaneous decision to visit the Grand Tetons on our fourth day there. The park was filled with smoke from the Canadian and Montana wild fires, so we didn’t get the clear views I’ve seen in photographs but it was gorgeous none the less. Highlights included visiting Leeks Marina, Mormon Row, the Elks Ranch and seeing bison for the first time this trip (MY FAVORITE!). Friday was our final day in Yellowstone and we hadn’t yet viewed the famous Yellowstone Falls or the Grand Canyon of Yellowstone. Hayden Valley was nearby and I loved it! We saw Bison walking over the road, saw calfs playing and watched a few ford the river. Although Bison can look docile they can actually run up to 35 mph and are very quick! We headed back to Washington on the sixth day of our trip. We had planned on spending the night in Montana, but with a new wildfire in the area, we chose to drive straight home. Thankfully, we stopped long enough to get huckleberry milkshakes. Overall, my first road trip was a huge success, and I'm thankful to have married into such an awesome family!